You can have a healthy Middle Eastern treat, toasting a pita in the shape of a bowl—basically a form of homemade ​pita chips—all the great flavor without the deep frying. Filled it with vegetables and nutritious chickpeas and called it lunch. In a small bowl, toss the chickpeas with the tablespoon of olive oil and the 1/2 teaspoon of Za'atar. Spread out on a baking sheet lined with parchment paper. You can make the pita bowls at the same time. Rub both pitas with the tablespoon of olive oil and sprinkle evenly with the 1/2 teaspoon of Za'atar. Microwave for 20 seconds to make them pliable. To form the bowl, drape them over a small, oven-safe bowl or even the back of a muffin tin cup. If you have nothing like that, you can also form balls out of aluminum foil and drape the pitas over them. Bake both the chickpeas and pitas for 12 minutes. While the pita and chickpeas are in the oven, make the dressing by whisking together the olive oil, lemon juice, tahini, and Za'atar. 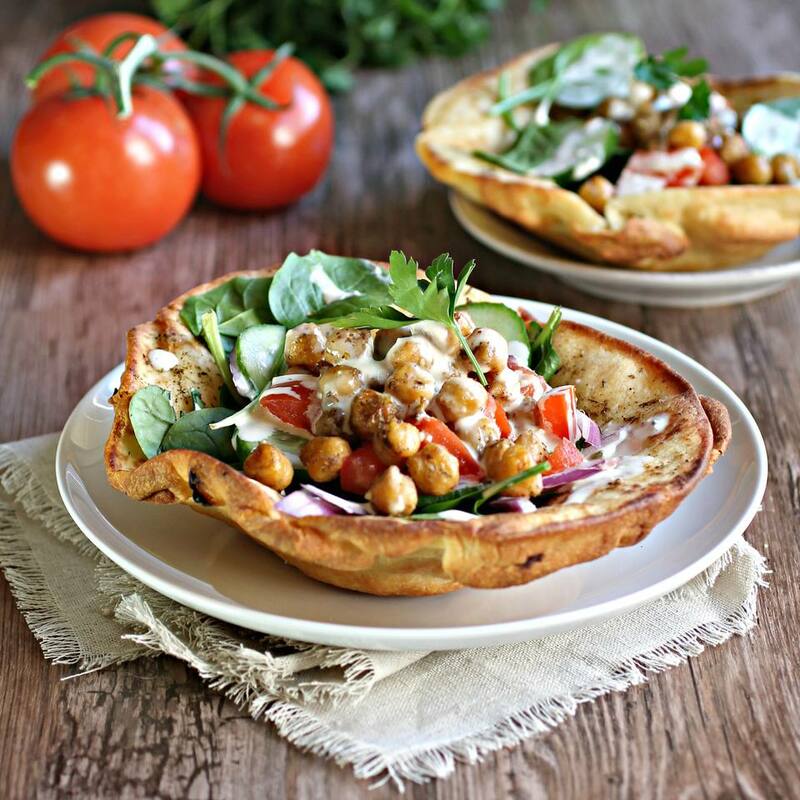 When the pita bowls have cooled off enough to handle, assemble the salads by adding equal amounts of the baby spinach, tomatoes, cucumbers, red onion and roasted chickpeas to each pita bowl. Top with the vinaigrette.